Just Romantic Suspense: Writing as a career or a calling? Writing as a career or a calling? I think all writers at one time wonder why they write. And I would say a large portion of them do it because it’s a calling…not a career option. And most of us don’t make enough money to live off of the craft, though a select few do…and of course we all hope to get there someday. But if we don’t, do we quit? And for those who say yes, it was likely more of a career choice for them. For me, it’s a calling. There are a number of stories going on in my head at any given time. Like movies that play out in your mind. Life can certainly get in the way. Fulltime jobs. Families. And the first thing that takes a backseat is the writing. But never is there ever a shortage of ideas. That’s when I need to sit back and reprioritize my days’ schedules and get my writing back on track. The voices in my head don’t stop. They demand action…maybe my own form of schizophrenia. It can be anything that strikes a writer’s fancy from a conversation, to something seen while walking down the street, or an article read on the Internet. You may one day be fodder for a writer’s story and never know it. One on the latest stories to buzz the net is the boy who wandered from the forests of Germany, stating he had just buried his father and that they had lived in the forest for the past five years. He couldn’t remember his life before except that his mother died in a car accident. Seems the years before are lost in amnesia. His story has yet to be proven, and there are doubters, but isn’t this the stories fiction is born out of? I write Romantic Suspense because I delve in dark things, oddities. These things fascinate me. The latest thing to capture my attention on the television is the Discovery Channel’s The Devils Ride. Supposedly an OMC (Outlaw Motorcycle Club) that is being followed by a camera crew. Really? An OMC that actually allows that? Although I am caught up by the show, I think the Sons of Anarchy has gotten it closer to the real deal…and that’s fiction. The Devil’s Ride, fact or fiction? I still watch because OMCs fascinate me and I’ve written fictional books about them: KISS OF DECEIT and EYES OF BETRAYAL. Including my latest work in progress, SONS OF SANQUE. Again—I allow my fascinations in life, to spill into my fiction. Jaycen glanced up and saw the five-by-seven wedding picture on the dresser across the room. So damn much had happened in the few months since Kelly Jo stormed out of the house. If he could only go back and change his parting words. Tell her how much he loved her. But truth be told, they hadn't gotten along for much of the past year. Ever since Alexis passed away, Kelly Jo swore he’d crawled inside himself to an unreachable place. Neither of them had been good at handling grief. They took it out on each other after ten-year-old Alexis succumbed to leukemia. He was supposed to be there for her first date, take pictures of her prom, teach her to drive…walk her down the aisle, for chrissake. Not stand over her casket as his tears washed her lifeless face. Kelly Jo handled her grief differently and wanted what they had before Alexis died. Didn’t she realize they could never go back? Jaycen rocked back on his heels, trying his damnedest to keep the images at bay, his gaze fixed on the floral wallpaper. Paper Kelly Jo had picked out, the matching quilt on the bed. The whole damned room was stamped with her presence. Other, more disturbing images from three months past flooded his thoughts. A cardboard box, attention Jaycen McCain. No return address. Standard packing tape sealed all edges. Hardening his jaw, Jaycen stood, picked up his Glock and whipped it across the room, smashing the picture on the dresser, sending glass shards scattering and tinkering about. Jaycen grasped it from the stand and pulled the cord from the wall, ending its trill. Just as he was about to let it sail across the room, the fight drained from him, leaving him numb. The phone dropped to his feet. Running both hands down his whiskered jaw, he slumped to the mattress, fighting off the signs of an oncoming panic attack that had begun plaguing him since about the time his wife left and never returned. He lay back across the bed, dangling one arm over his eyes, and concentrated on steadying his breathing. He recalled the day he opened the box. Using a utility knife, he’d hastily slit the tape and jerked open the flaps. His stomach turned. He dashed for the bathroom, leaping over the broken glass. Grasping both sides of the basin, he dry-heaved. Inside the box, preserved in a vacuum-sealed food storage bag, had lain a severed left hand, complete with wedding ring and mole, Kelly Jo’s latest manicure bloodied and tattered. 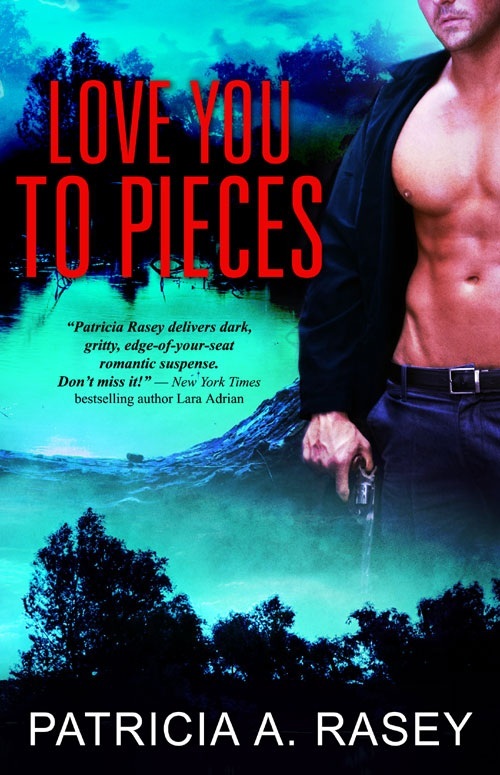 You can purchase LOVE YOU TO PIECES from Amazon and BN.com for $2.99. Thank you to JUST ROMANTIC SUSPENSE for having me here today…and to the readers who have visited. I appreciate it. It is for you, who we tell our stories. Today and tomorrow (June 18th-19th) I am giving away my book THE HOUR BEFORE DAWN for FREE at Amazon. So instead of doing a contest—I set a FREE day so that everyone who visits can get a FREE book. 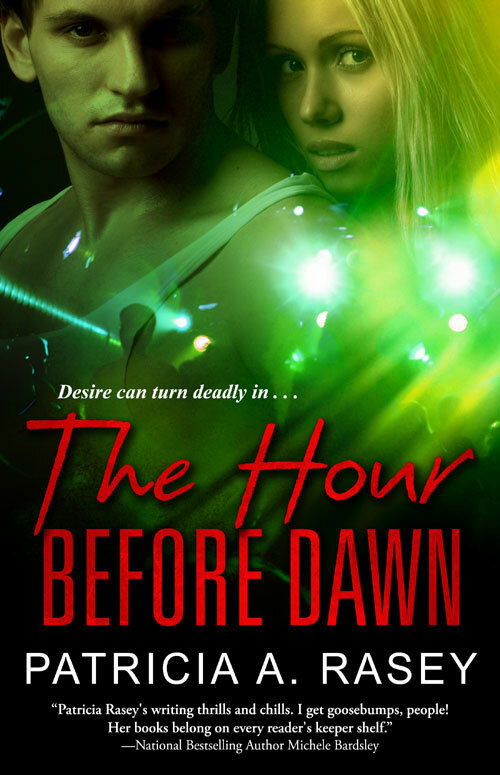 THE HOUR BEFORE DAWN is the sequel to my book DEADLY OBSESSION (also available from Amazon for .99). I agree, Pat, writing is definitely a calling. You never know what will stoke your imagination!